Property 4: Fill up with nature ... in the Pyrenees! Townhouse 3 floors with views of Vielha. Property 27: Townhouse 3 floors with views of Vielha. 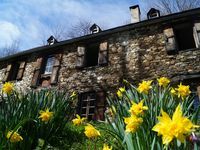 A nice, quiet home right next to some great walks in the Pyrenees! The home was very simple and comfortable, and we had a great time while we were there. Trevor was very helpful all along the way! We had a lovely week relaxing and walking in the mountains nearby . The house was well equipped and very spacious. Thank you ! we will definitely return.